All you need to do is share your unique invite link with a friend – when they reach a milestone while playing the game, so will you, and you’ll both earn a reward! Kegs, Reward Points, Arena Tickets and Legendary Premium Cards are up for grabs! Learn more about the Invite a Friend program here. Did you mean you already invited all your friends? If they are new, request them to create a new account using your link. Otherwise, you may have to send it more distant friends with hope that they start and like it. Did you mean you already invited all your friends? But I think you know what I really meant. "Your friends will only be able to sign up using your link if they never played GWENT before. " Thats is pure stupidity right there CDPR, all my friends alredy tried Gwent when it was in Beta, nearly all of them gave it up when HC was launched, and now I can't even use this invite program to try to get them to give the game another try? WTF were you thinking? You need to get rid of this requirement ASAP and allow people to use the invite incentives by simply linking up with other friends on their friend list, even when they already tried Gwent before. I guess console players are omitted. Am I right? Moderator: A couple posts have been deleted. Keep comments respectful, please. This is a good idea. I'd love to see it extended to include players who have not played since Homecoming's release. Any of the people I know who might be interested in the new Gwent already tried the game in the CB or OB. I have some friends that already have played Gwent a little, and some that have not but do have Galaxy. When I give them the referral link, the only thing they can do it download the client (which they already have and already have signed up)! So how can they use my referral? Those are actually sweet rewards. I like the fact that you can get the best rewards if your friends stick with the game for long, this will reduce the amount of smurfs that will inevitably be made with this kind of event. Of course. Console players are an after thought. If that. So basically even my friends who have not even played Gwent before but have GOG cannot use this?! 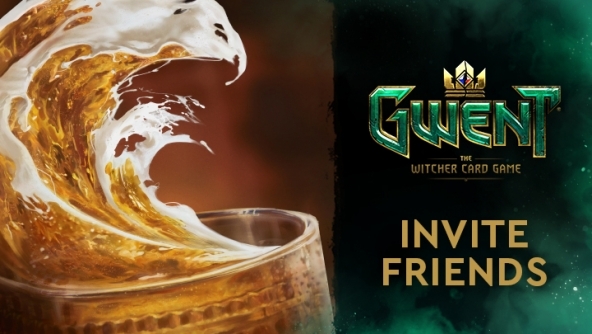 Sorry CDPR, already been trying to make all my online friends try Gwent for the past 2 years, there's no one left. On the plus side (for me), i really dont need any of those things you're giving, and im afraid i never will again. Is this considered to be discrimination from CDPR? or is it no ball/whipped syndrome from my end? P.s. i'm joking.................., i have one friend. Hello @Dominika how exactly is recruit code supposed to be used to link with people, who have their GOG account already registered, GOG Galaxy already installed, but never played Gwent, so I am recruiting them to try it? This needs to be answered. Seriously, I don`t want to be rude but how do you mess up a referral event?! Come on Devs, this should be much simpler than this...!